Are Your Kids Allowed at Work? I had my wife and four year old son, Apollo, stop by the office the other day. My wife needed someone to look after Apollo for a couple of hours, and I had nothing on my calendar. Because I’m high-tech, I have extra computers which can access all the best internet games at nick.com and nickjr.com. Apollo hung out with me for a couple of hours while I continued to get my work done. The old saying "it’s the little things that matter" really applies to the life of an independent practitioner. Having my son stop by the office to hang out while I work was simply not a realistic option as a partner at my old law firm. As an independent practitioner owning my own law firm, it happens all the time. There’s nothing better than watching your son play computer games while you run around the office getting stuff done. Can you bring your kids to the office? Dan Hull Over at the What About Clients? Blog has a Great Post on Maintaining Focus on Client Service in Your Law Firm. Dan digs deep into the question of establishing a culture which demands daily excellence. Dan makes the excellent point that discipline is required to create and execute a plan. Too often, lawyers simply drift through their cases. They are billing by the hour so there is no incentive for laser focus and a commitment to execution. One of the great things about our use of the Basecamp extranet is that all client project benchmarks are defined and executed in a chronological fashion. All to do items are identified. A client can see all of the to do items that will achieve their goal laid out right in front of them. We are completely transparent. Great job Dan and keep up the great blogging. Our President knows so little about technology that he refers to Google as "The Google." For those of us in the blogosphere, we all know technology. We are jaded somewhat by the fact that we all get it. We should remember that in the blogosphere we are often singing to the choir. Good lord, he doesn't even email because he is afraid someone might say he actually did receive information (which presumably he would want to deny)! His statement reminds me that technology can make people accountable. Our extranet makes us transparent to our clients, for instance. Many lawyers have the same attitude as the President. They spend their days insulating themselves from being held accountable. As far as we have come in the technology age, there are still many more miles to go ...ogle. All of the reasons that are often sited for choosing not to blog seem legitimate on their face. To those people who use those excuses, they are legitimate. Some of those reasons are in fact legitimate. But for lots of people, blogging makes sense, and many of those people are not blogging. For people who want to invest in themselves, blogging offers the opportunity to say what you think. Not what your company thinks. Not what your profession thinks. Not what is politically correct to think. Good old fashion first amendment say what you think. Some blogging isn’t for business. Some blogging is revolutionary on a more personal level. For the first time in history, the little guy can speak up and, through the power of his or her ideas, have an impact. The internet era isn’t an era of privacy. If anything, it is an era where mankind gives up their privacy. The internet takes away our privacy rights by making us more exposed. But one constitutional principal is purely enhanced by the internet. That principal is the first amendment. The right to say something you want to say. So, blogging is not for everyone. It certainly isn’t for people who would rather be politically correct all the time and certainly not for people who marshall their words with such precision, fearful of other people’s opinions about their ideas. Blogging often isn’t for people who are really focused on preserving the status quo. Blogging is not for people who have nothing to advocate. By the way, if you fall into this group of people who have a great excuse not to blog, you will soon be in the minority. It’s just a question of time. Look at the number of people using MySpace or Youtube Look at how many people are blogging, sharing their lives online. Remember that a blog started in many ways as an online journal. It was far more personal in nature. The concept of debating "blogging for business" has only come later in the game. There is a giant wave coming and building. The early adopters will be in a much better position to ride that wave. I’ve decided I have to take a little bit of a new tact with yoga. Usually, I arrive and I’m so wound that getting into a "focus on your breath" relaxation mode is be extremely difficult. So tonight, I started to get in the right frame of mind from the moment I step out of work. We’ll see if that helps settle my brain a little faster. Speaking of trying to make our mind "still," did you ever notice that practicing law can sometimes have the opposite affect? If we lose our mental balance, we lose our ability to focus. It’s really that simple. A distracted mind is not one that will make solid, strategic decisions. I’ve now had my firm for over a year and a half. Things have been extremely successful, but I find myself more easily distracted as habits of distraction begin to increase and become habits of their own. That’s why yoga feels so good. It’s my one opportunity all week to remember that life and the practice of law are merely illusions. It is not the outcome of our practice that’s most important; but how we practice. It is how we practice that defines us as who we are. As lawyers, as mentors to clients, and as family members. The most amazing thing has been happening. I lay down in bed and I can picture the kite over my head flying high in the breeze. When you’re learning to kiteboard, the safest place for the kite is directly overhead; it’s where you start and where you, hopefully, finish with the kite. When you’re going to switch the direction, the kite goes back overhead. There were times when I was kiting last weekend where I would have this tremendous ride all the way to the right. As I approached the shore, I would move the kite back directly overhead and fall back into the water, floating and watching my kite above my head. Now I find myself daydreaming about the kite above my head. I can’t begin to describe how proud I am of my achievement. My decision to learn to kite. My commitment to making it happen. My achievement and actually riding. Would that day have been possible without the magic of digital dictation? Why Blogging Matters. Six Degrees of Perspective. Debbie Weil over at Blogwriteforceo’s blog turned me on to this post from Eric Kintz over at the HP executive blog area. Since I was outing a couple of HP Executives who are not blogging much, I was extremely pleased to see that Eric Kintz is not only putting a lot of content online, he’s putting great content online. Mr. Kintz is an example of the best that blogging has to offer. · "We are living an age where boundaries are collapsing, definitions are changing and roles are combining. Blogging and PR need each other, belong with each other, even though they can sometimes appear to be working against each other." 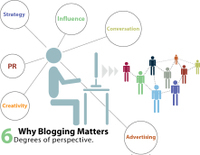 · "The blogosphere has disrupted the economics of publishing, dramatically lowering the costs of content creation (most bloggers are not paid), content production (free blogging platforms) and circulation development (free links by other bloggers). This has allowed in turn a micro-segmentation of customer markets that was not economically viable in traditional publishing business models and the rise of new influencers, who are closer to those markets and are in the best position to appeal to their specific needs." · "The utilization of blogs is critical, particularly in a growing world where social currency is more and more important. They are powerful communication and business tools which can connect with a variety of audiences for your brands/products/services. These audiences range from core customers to prospects to influencers to investors." · "In terms of functionality, the primary differentiation between a blog and a standard site is the ability for the audience to comment and engage. Measuring that engagement on a classic ROI metric is nearly impossible, but some discussion is emerging on the proper ratio of postings to comments. Some bloggers attract more than 100 comments per post, but a ratio of three comments to every post seems healthy for a relatively new blog. That ratio is an excellent measure of engagement, one of the primary benefits held up by advocates of corporate blogging." I am pretty into dictation. I have never seen web dictation until recently. Web dictation allows you to dictate directly to a Java application access through your web browser. This means you can dictate from anywhere with an internet connection. Check out this free web dictation software here.